Conference Venues South Africa is pleased to announce the inclusion of Snowball Conferencing to our list of conference venues. Snowball is a public video conferencing boardroom in Techno Park, Stellenbosch. The boardroom is fully equipped with a high definition video conferencing system which is compatible with all modern systems worldwide. The offices are found at the highest point of the business park and have stunning views of Table mountain and the surrounding vineyard area. The Vidyo video conferencing bridge allows for multi party conferencing, desktop interfacing and inter vendor operability. This will allow users to achieve significant remote interaction, which means that senior management personnel are able to connect with more delegates more often without the need to travel. The boardroom is available during office hours, or at an additional cost, may be available after hours as well. Snowball is an Internet Service Provider and can guarantee a high-speed online video streaming experience. The Hoopenburg Conference Venue is situated in Stellenbosch and can accommodate a maximum of fifteen delegates. 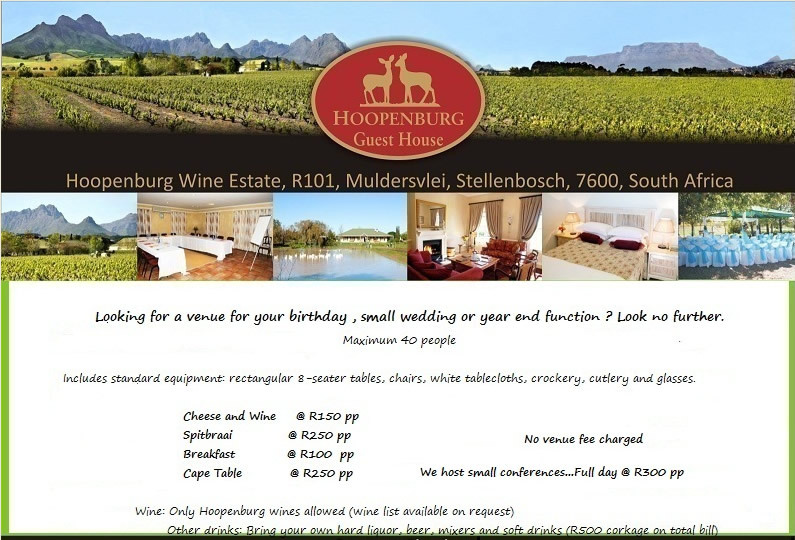 Hoopenburg is offering the following function and conferencing specials for the winter. Looking for a venue for your birthday, small wedding or year end function? Look no further. Inlcudes Standard equipment: rectangular 8-seater tables, chairs, white tablecloths, crockery, cutlery and glasses.